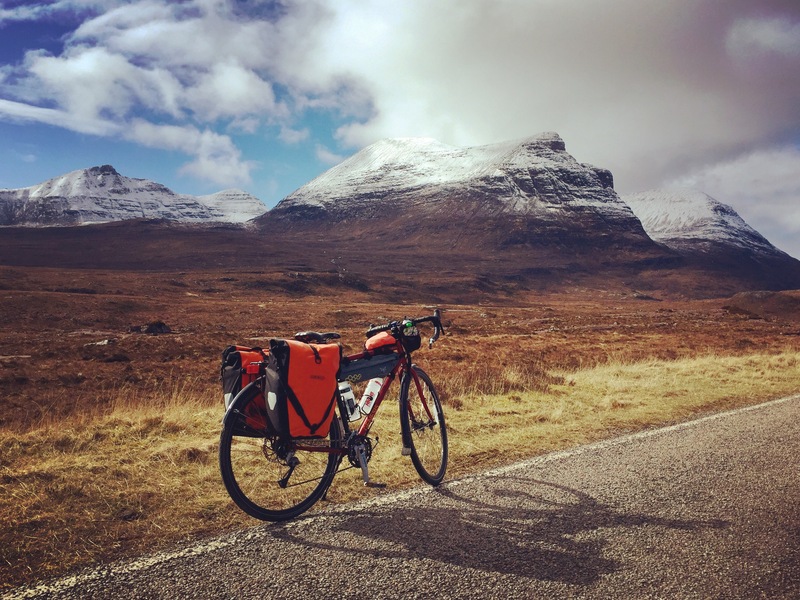 The North Coast 500 is a circular route showcasing some of Scotland’s finest scenery. 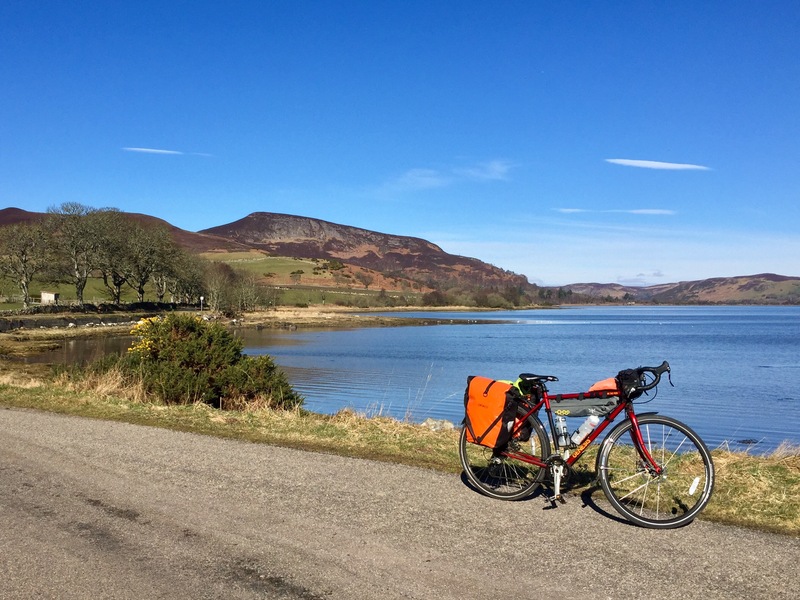 Starting in Inverness the route heads west to the Applecross peninsula and hugs the coast taking in the top slice of Scotland. 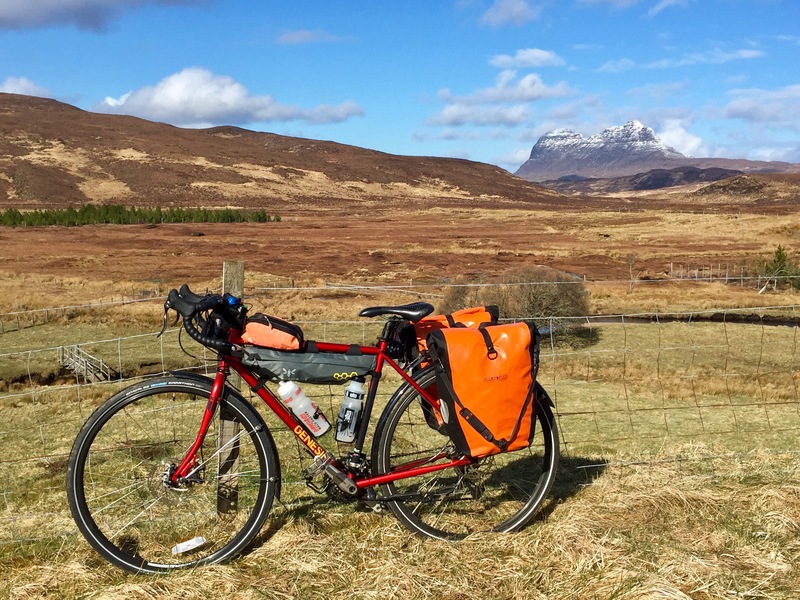 I had a week off work and this was to be my March challenge, riding solo and unsupported. I didn’t give it much thought until it was Friday night and time to pack. Yikes! 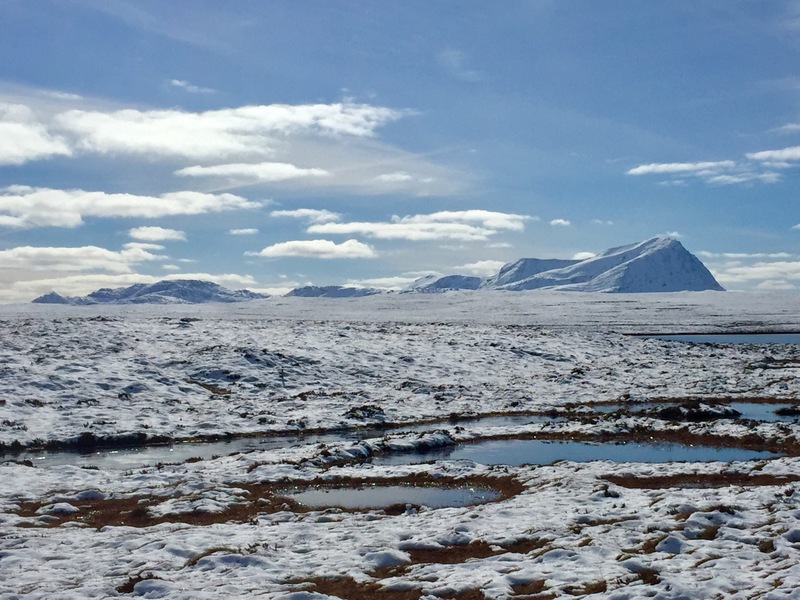 I drove up from Edinburgh slightly apprehensive; there was snow at the side of the road, it was 1 degree celcius and the forecast was grim for the next few days. This was a challenge and no one said it was going to be easy. I abandoned my car in a residential street near the canal and set off hoping I’d be back by the following Sunday! 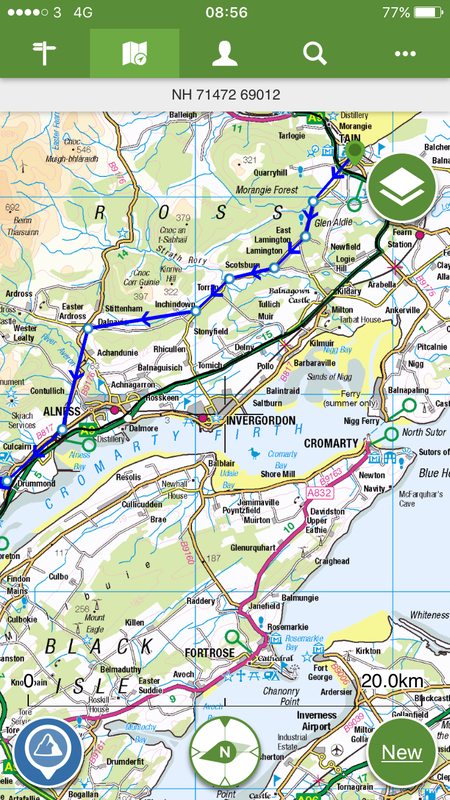 I followed a suggested route through Beauly and Muir of Ord to reduce the time on busy roads until the inevitable at Contin. I’d also suggest the quiet short cut via Kirkhill on route to Beauly. It was a fairly gentle ride and apart from a few showers, the weather was pretty kind. 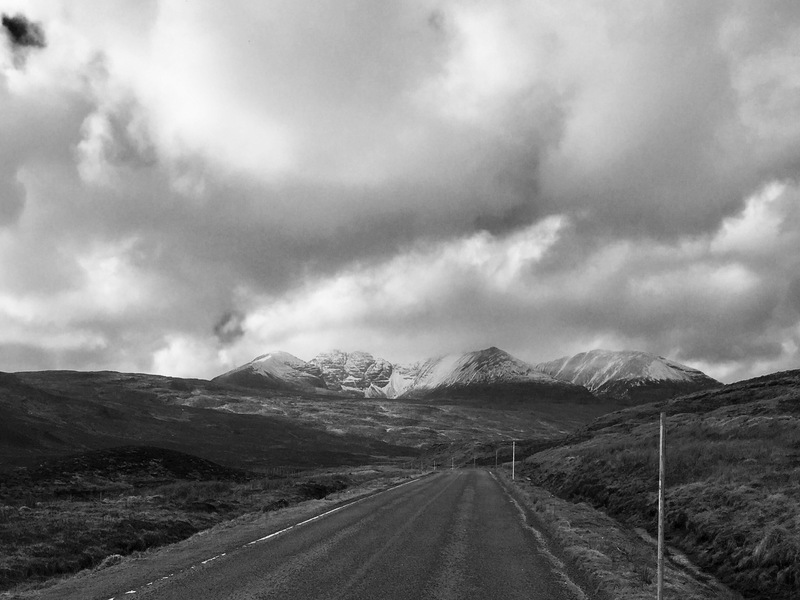 From Garve the scenery started getting more interesting with rolling snow topped hills hugged by low cloud. 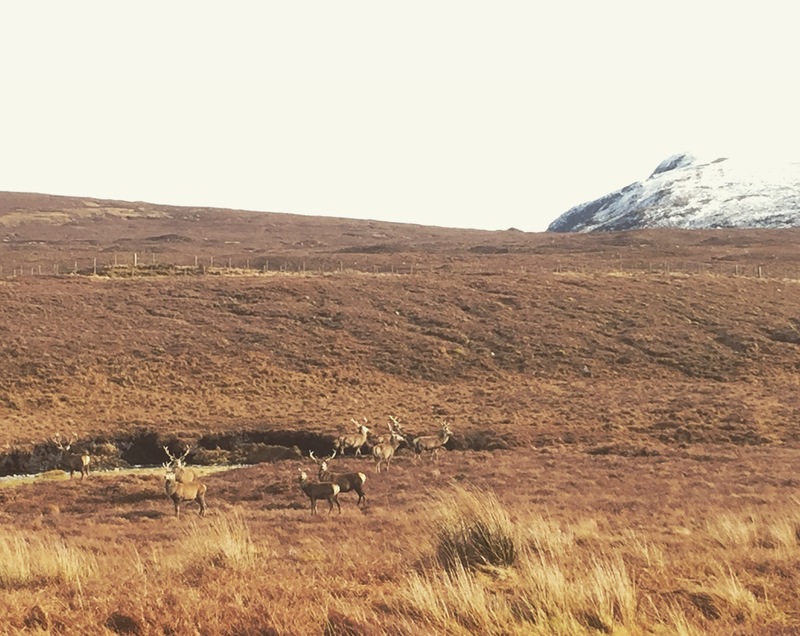 I kept stopping to take photos of all the stags at the roadside looking on curiously. As I dropped into Achnasheen I was hoping for a cafe stop but it was still closed and there wasn’t any sign of life at the hotel either. I pushed on to the Sanachan bunkhouse in Kishorn. Watch out for the steep climb out of Loch Carron just before you get to Kishorn. I was exhausted by this point but thought if I can’t get up this wee hill, what hope do I have for the Bealach? This was the longest I’d ever cycled and I was a bit bedraggled by the time I had arrived at the bunkhouse. Wrists, neck and lower back were feeling it and this was only day 1! I’d spotted a seafood bar on the map (would surely have a veggie option?) but it was closed too. Note the pattern…….who comes this way in March? Emergency adventure meal no. 1 to the rescue. I had a good chat with the owner about adventures in the hills and their plans to build a log cabin later in the year. Perfect spot for cyclists. 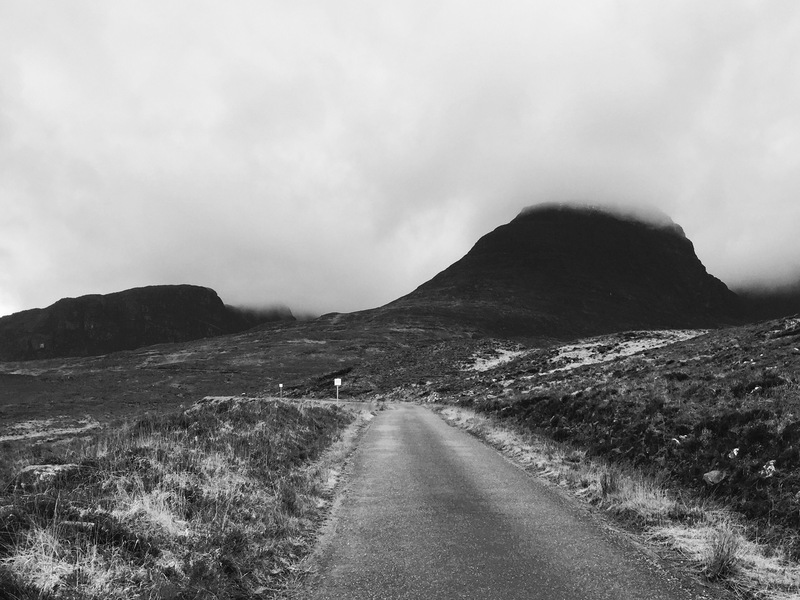 I knew this was going to be a toughie, with the Bealach na Bá just around the corner. It means ‘Pass of the Cattle’ and resembles alpine passes with steep gradients and switchbacks, climbing to 626m. The forecast shifted from heavy rain to cloud so I set off just in my shorts ready for a sweaty climb and fine views. I caught my first glimpse of what I guessed must be the route and it seemed the weather had different plans. A few minutes later the wind had picked up and it was lashing down. Full on waterproofs and nowhere to hide! The climb to the start of the switchbacks is long and relentless and probably the worst bit. At times I couldn’t pedal because of the headwind. The plus point of doing it this time of year is the dearth of traffic. Eventually I made it to the top and there was a wee lift in the cloud. There’s a viewpoint a bit further up with views over to Skye, Rum, the Outer Hebrides and Wester Ross but I was cold and wet and didn’t hang around too long. 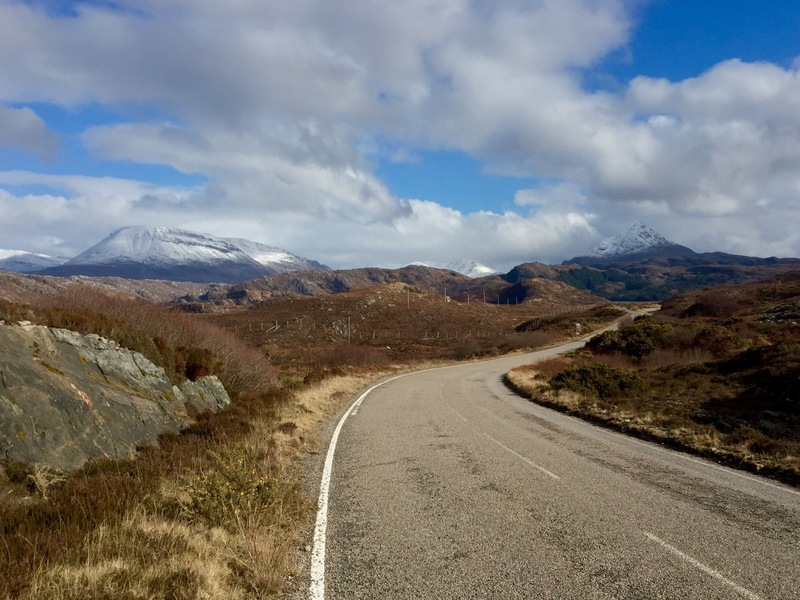 From here, the descent to Applecross is awesome with sweeping corners and the type of speed that makes me glance down to check my front wheel is on properly. I had to stop and put more layers on, it was flipping freezing! 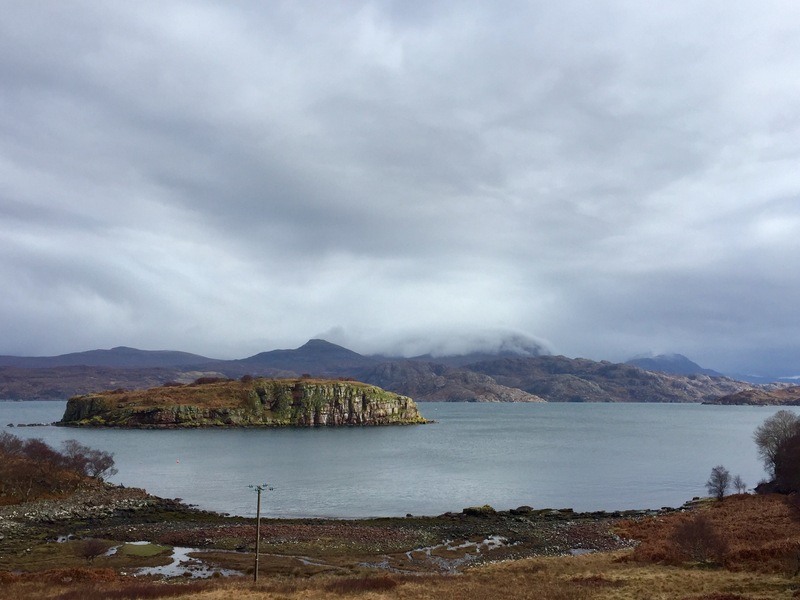 I headed straight for the Applecross Inn for coffee, hot chocolate and radiator hugging. I’d gone through 3 pairs of gloves with the rain and was pretty soaked. Clothing is always tricky to predict but I was grateful I’d packed spare waterproof gloves and a jacket. 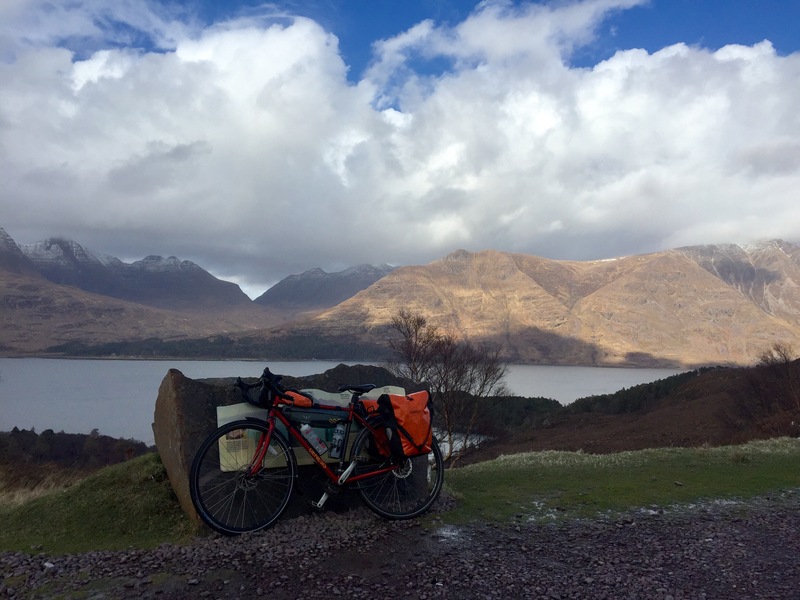 The next section to Shieldaig follows the coast around the Applecross Penninsula and was actually harder going than the Bealach. It’s a series of short sharp leg zapping climbs that seem to go on forever! 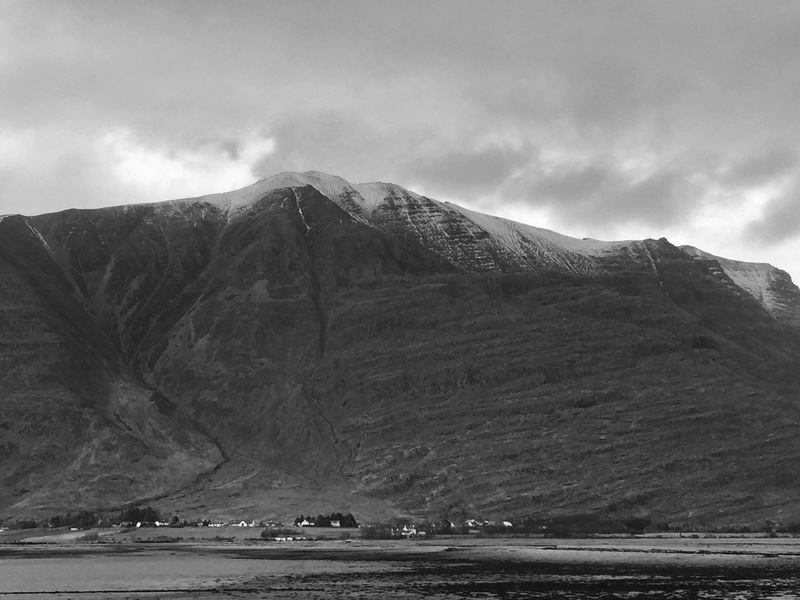 I decided to keep going to the Torridon Inn and got some fine views of Ben Alligin and Liathach. After a fuel stop I charged on to Kinlochewe as the rain wasn’t far behind. It’s fairly flat up Glen Torridon so a good way finish off a big day. I didn’t quite manage to beat the rain and my heart sank when I arrived at the bunkhouse/hotel and everything was closed up. A quick phone call to the bunkhouse number and fear not, the door is always open! It wasn’t the most inviting of places and emergency meal no.2 would be on the cards but it was 5pm, 20 miles to Gairloch and without internet I had no idea if I’d manage to get any accommodation further up the road. I knew the forecast for the next day was horrendous and would have liked to get some more miles in but it was too much of a gamble. I stayed put, dried my clothes off and enjoyed my rehydrated meal. I woke early with the wind and rain battering the window and was dreading the day ahead. 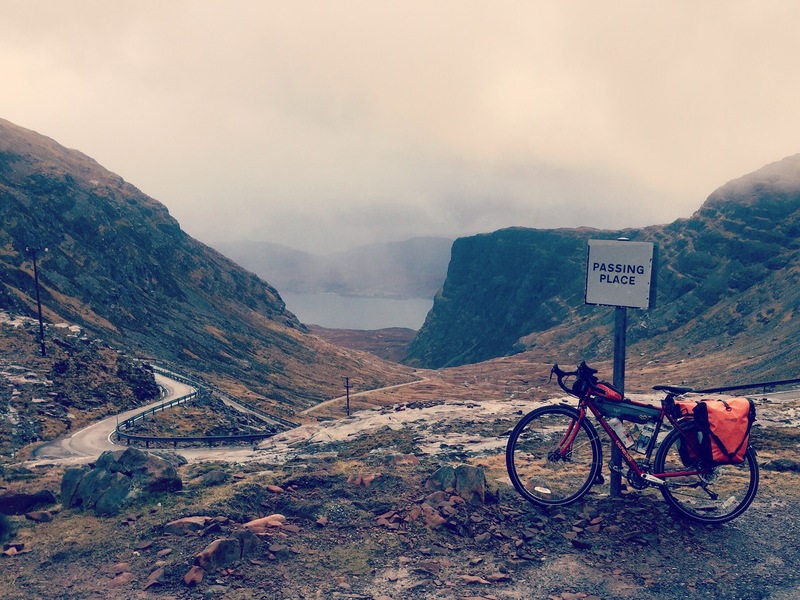 This was a big day starting off with 20 miles to Gairloch into a forecasted 40mph headwind. 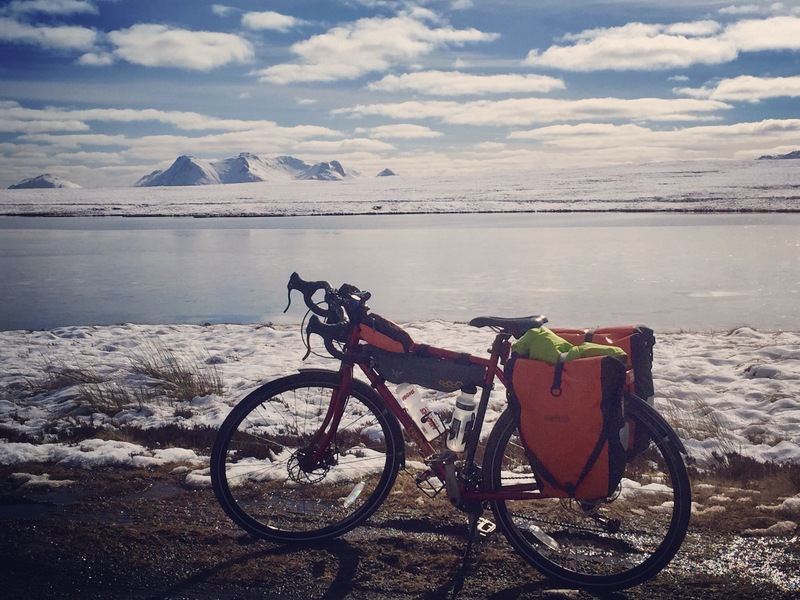 Part of me wanted to hitch a lift and not tell anyone, but I remembered my brother doing an etape in horrendous conditions and decided just to crack on with it. 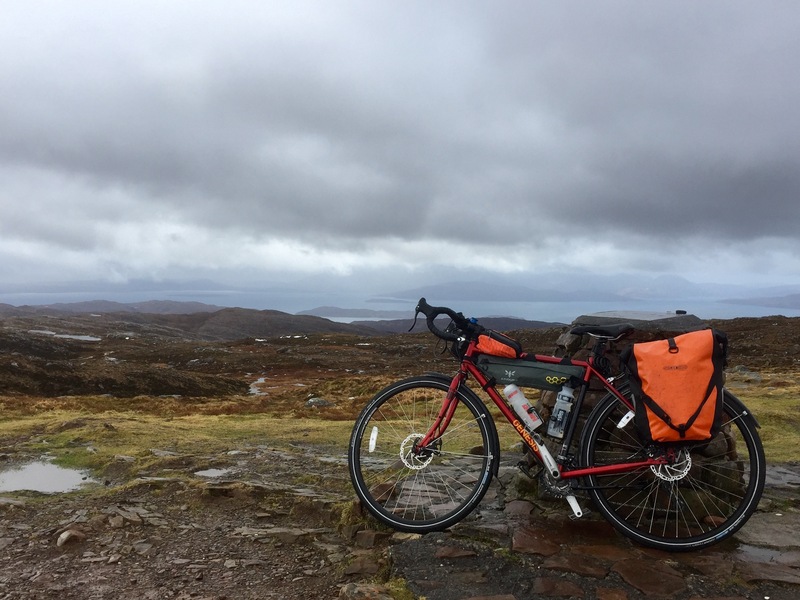 The ride to Gairloch was brutal in terms of the wind; I was barely moving in my granny ring. I was battered by rain, snow and hail but there were also moments of sunshine. I let out a whoop when I caught my first glimpse of the cafe down by the pier. 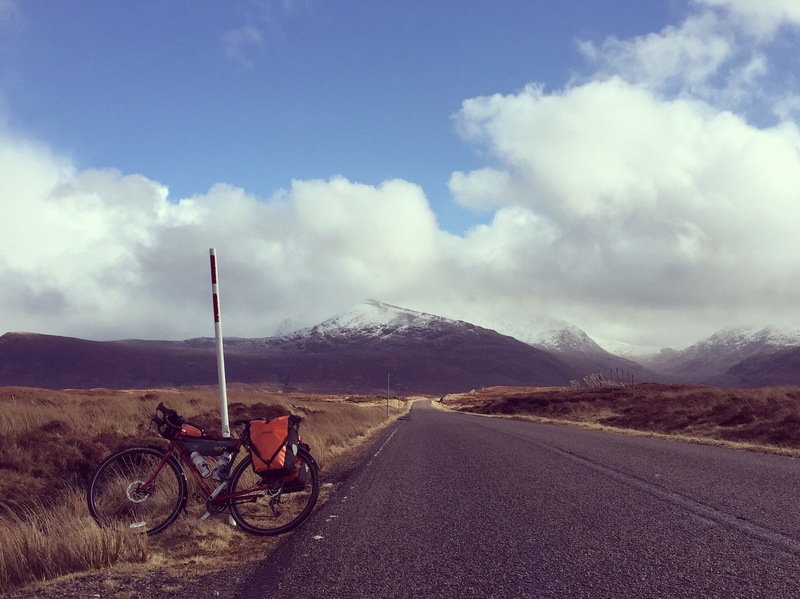 I was pretty broken by this point and there was still 59 miles between me and Ullapool. It was the first day of opening for the cafe (Coast Coffee Company) and thank goodness! It’s been taken over since I was last there and has a delicious menu that I would happily have worked through. 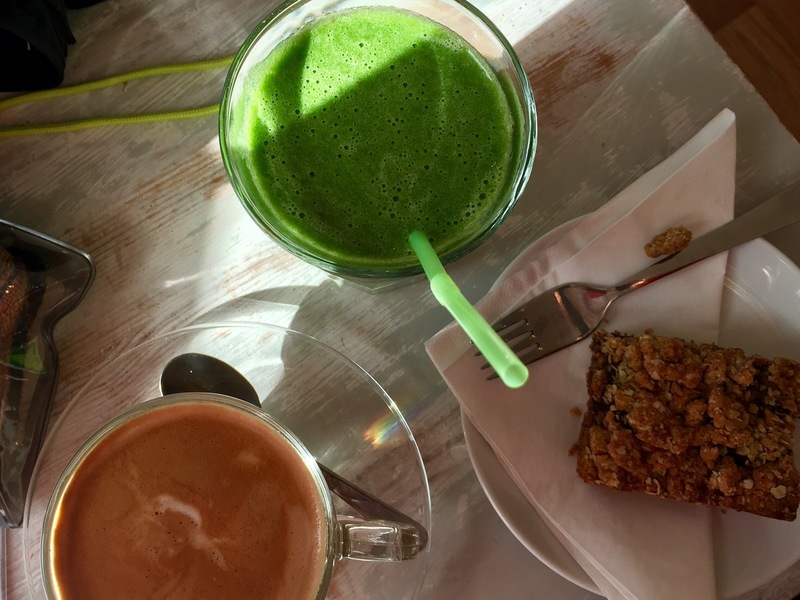 Unfortunately it was only 10.30am so coffee, smoothie and a date slice filled the gap. 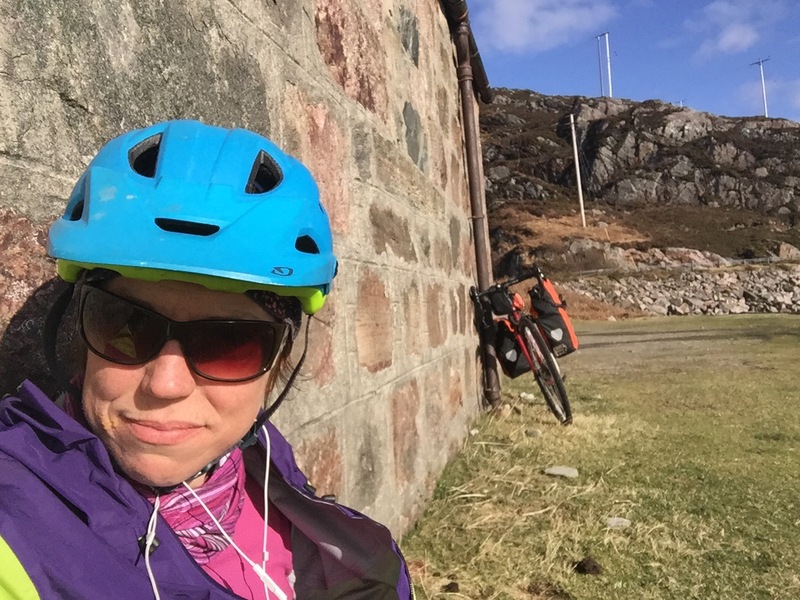 I’ve done the Tollaidh loop on my mountain bike before and knew there was a big climb out of Gairloch but thankfully the wind was behind me at this point and it wasn’t too bad. 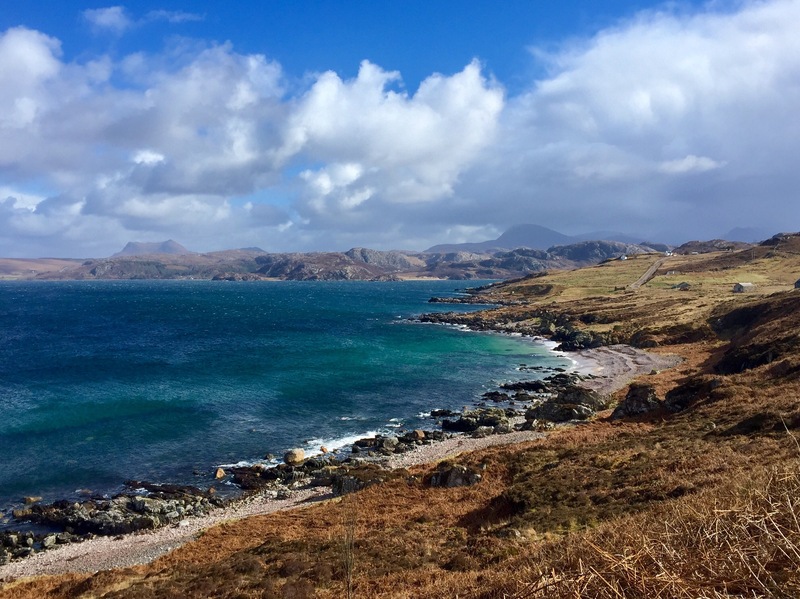 My dodgy knee had taken a hit battling through the wind to Gairloch which was a bit of a worry. Anyway, I kept going with the wind sometimes being a hindrance and sometimes my new best friend. More snow and hail showers and I actually got blown off my bike when I stopped at a viewpoint, not long after this……..
On some descents I had to pedal hard to move because of the headwind. Stunning views though over to Assynt, An Teallach and Sgurr Mor. I made it to Ullapool, pretty broken from the wind. I’d booked into the bunkhouse at the Ceilidh Place and took advantage of the log fire, a pot of tea and iced my knee. By now weight bearing was tricky and I was worried it was game over. Guess this highlighted the importance of conditioning. I ride my mountain bike all the time with no issues but this was a different bike and a different type of riding. I was super excited to get some proper food at the Ceilidh Place and not have an emergency meal! Big high five to the veggie options. 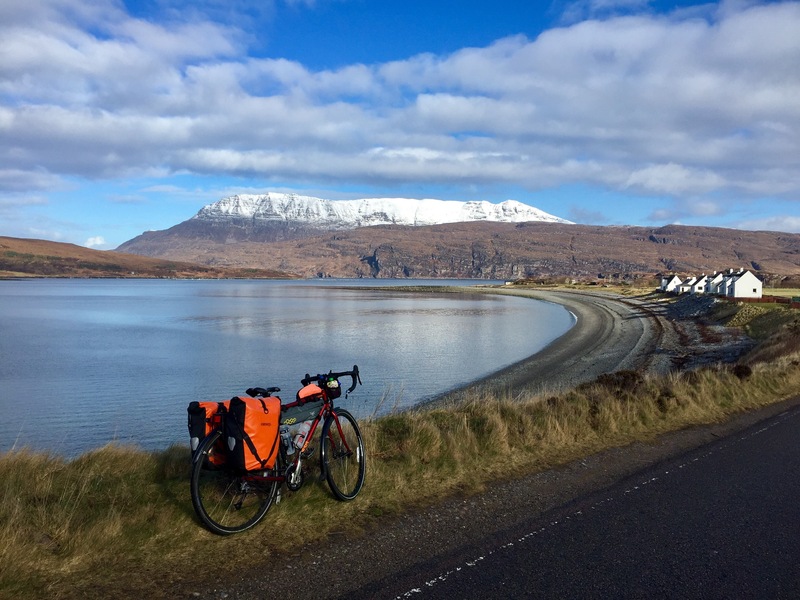 I was nervous starting the climb out of Ullapool. I knew the road and knew my knee would get tested. 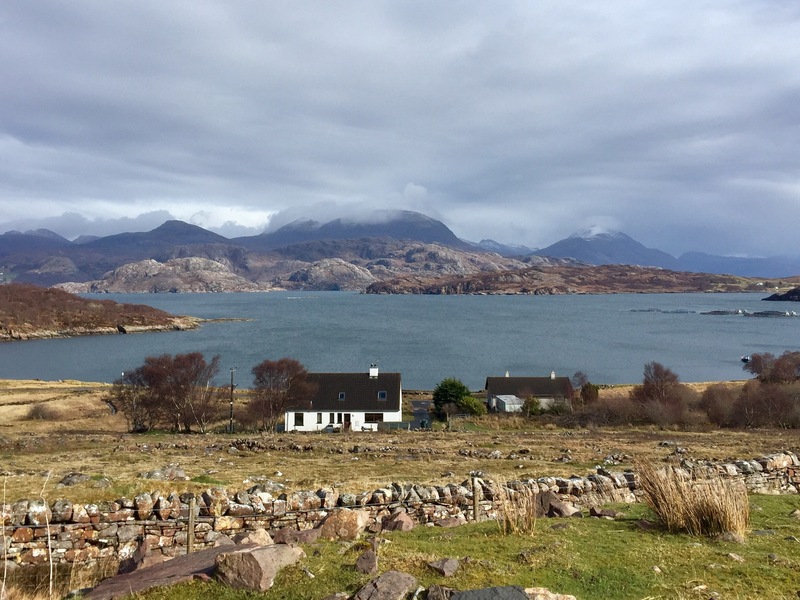 I road tentatively and enjoyed the views across Ardmair Bay to Coigach, Stac Polly and Suilven. Approaching Loch Assynt I had a decision to make – the direct route to Kylesku or the longer route via Lochinver and the stunning beaches around the penninsula. From spending a week up here before I knew the latter was a beautiful but challenging route with short sharp hills and twisty singletrack. My heart said that way but my head said to protect my knee and go direct. 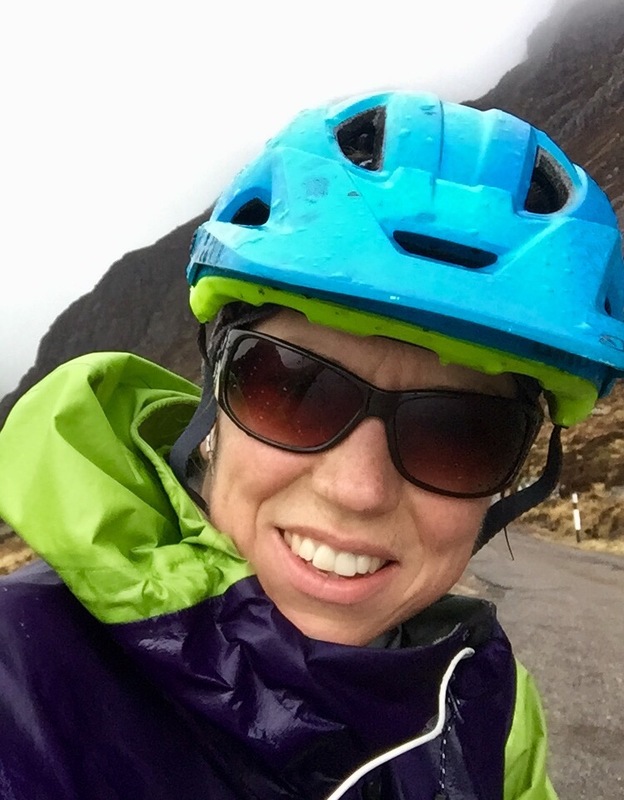 I went with my head and while I didn’t capture turquoise coves, I enjoyed riding past the snow topped peaks of one of my favourite hills Quinag. 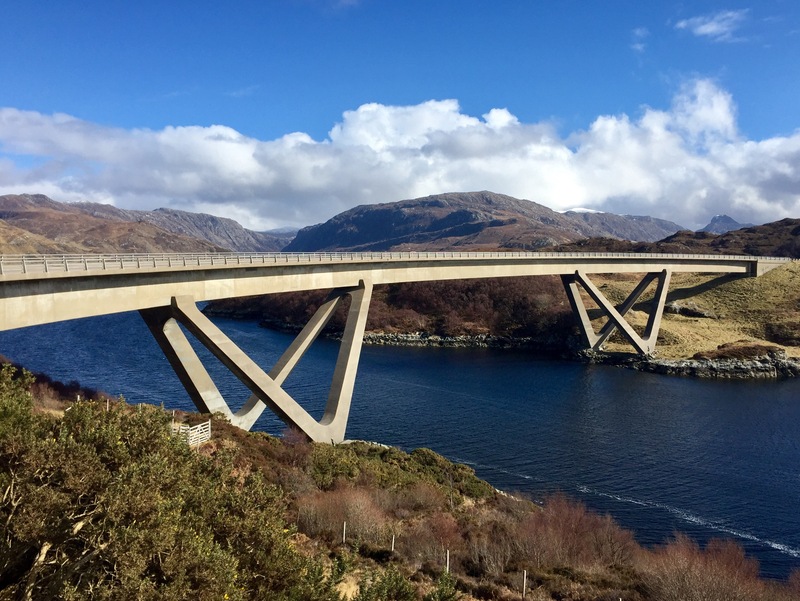 I stopped at the Kylesku Hotel for soup and coffee and had a peek at the bridge. After the climb out of Kylesku it wasn’t long before I was passing through Scourie and getting fine views of Ben Stack, Arkle and Fionaven (another one of my favs). 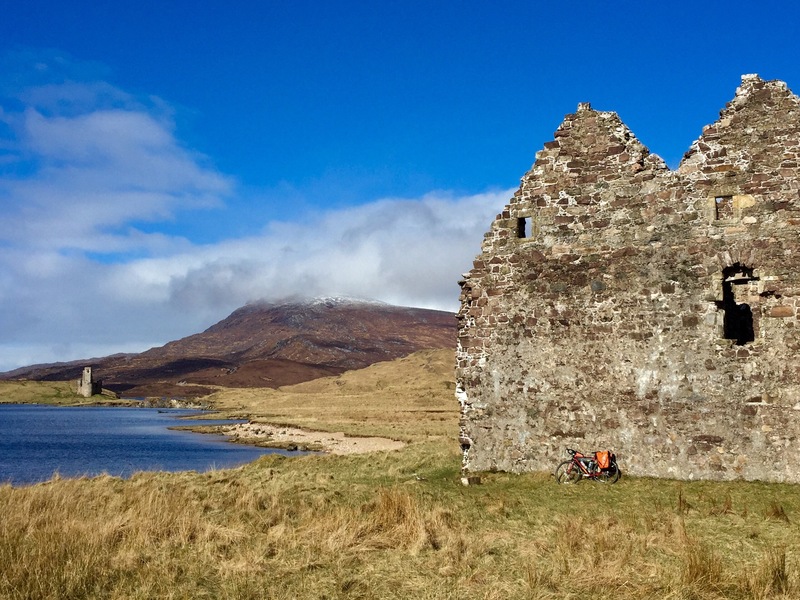 I took shelter from the wind behind an old fishing building on Loch Laxford and refuelled in the sun. After Rhiconich the road gradually climbed again and my knee started playing up. It was a case of head down and pedal the last 20km to Durness. I stayed at the Lazy Crofter bunkhouse which was perfect – comfortable and cozy. The hotel was closed so another adventure meal! The beaches were gorgeous but when you’ve got a lot of miles to put in, there wasn’t really any time for exploring. One of these days I’ll get to Smoo Caves! This was the first day of light wind and coupled with a big flat section from Durness tracing the shore of Loch Eriboll I was suddenly experiencing a completely different NC500. I stopped for a roadside view of Ard Neackie after seeing @loosemooose‘s photo a couple of weeks beforehand. 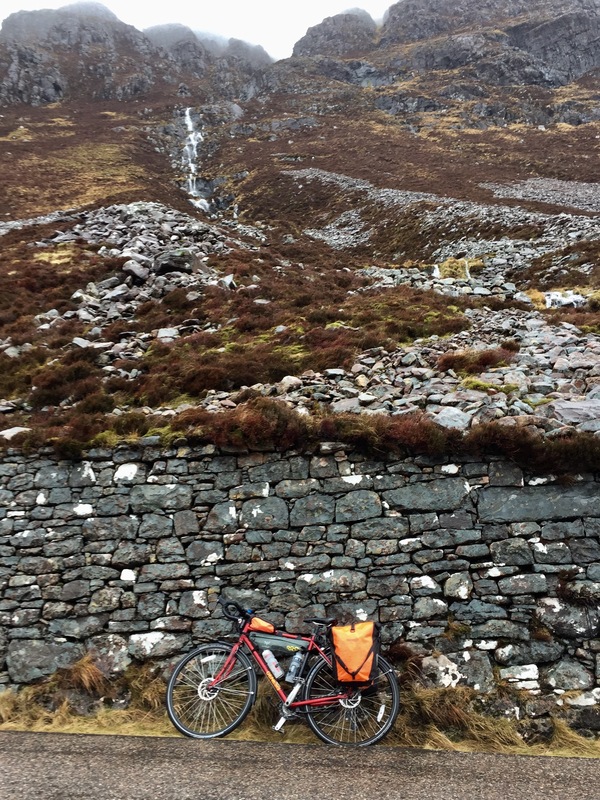 After a fast descent to cross the River Hope, there was a big climb up to Á Mhòine and this section is a strong contender for most breathtaking part of the trip. 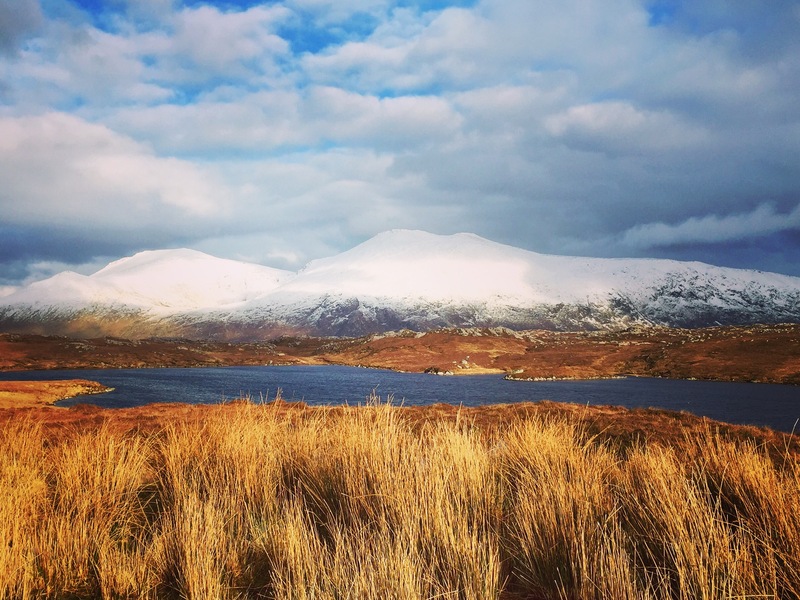 Perfectly still, just me, snow by the road, frozen lochans and stunning views of a snowy Ben Hope and Ben Loyal. I was in a moment for sure and could have spent the whole day up here. Another fast descent takes you to the Kyle of Tongue slipway. @belhavenbikes had sent me a message on twitter to visit Weavers cafe just after Tongue and promised it would be open, and so I did. A great refuelling stop and it has a track pump outside which is handy. 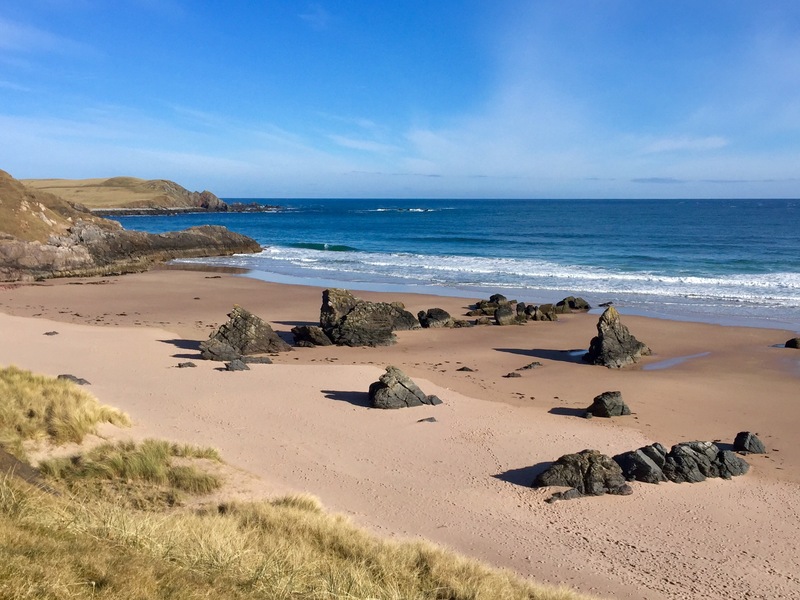 The beach at Bettyhill looked inviting but I needed to push on. Pretty much as soon as you cross into Caithness the road flattens. I managed to hit home time as I passed Dounreay and the road suddenly became very busy. 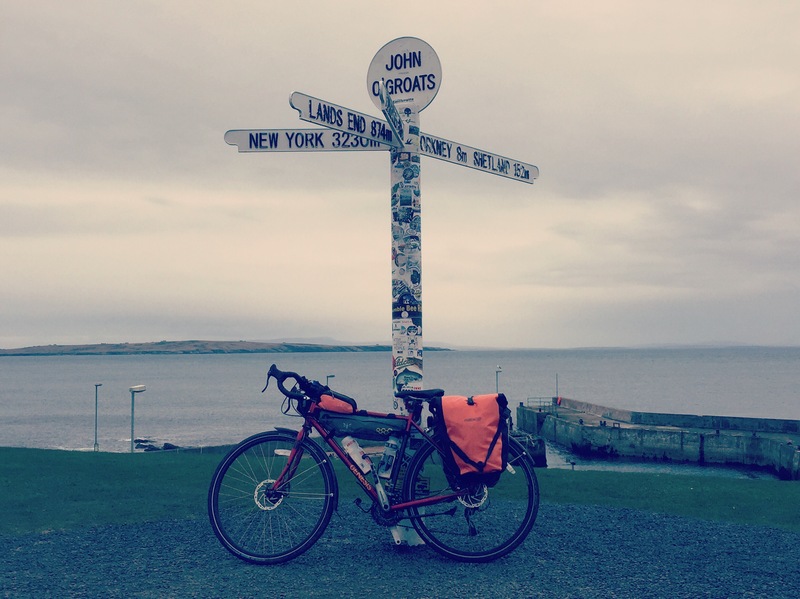 With the calm conditions I would have liked to get to John O’Groats but by the time I got to Thurso my bum was so sore I couldn’t sit on the saddle any longer and called it a day. It was an easy 30km to John O’Groats with a flat road and light wind. Before long, Orkney was visible and I was pulling in for the obligatory photo. I stopped for a coffee and to let my back have a rest – by now I was really struggling. Last year I had a pretty bad back injury and was anxious from day 1 that it was going to spasm again. 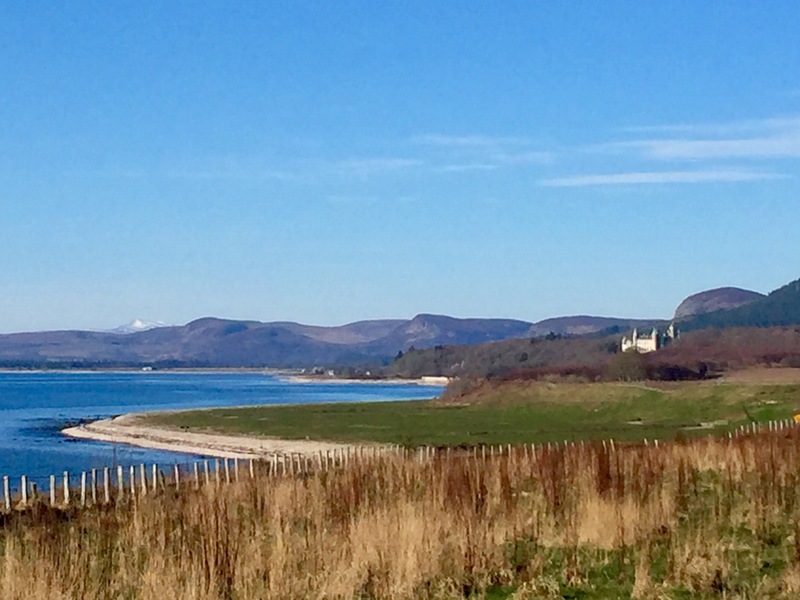 If you are doing the pure NC500 there is no choice but to head down the east coast from JOG and join the A9 after Latheron. I was back to having a decent enough headwind to make riding tough, and the first section from JOG was fast car territory. I was glad of the high vis vest I donned for this section. This part of the route is far less interesting than the West / North West corner and you don’t have the spectacular scenery to distract you when things are hard going. I stopped in Wick for lunch and the rest of the ride to Helmsdale was a sufferfest. My lower back was struggling and I was getting off the bike every 20-30 mins to do release exercises on the ground. 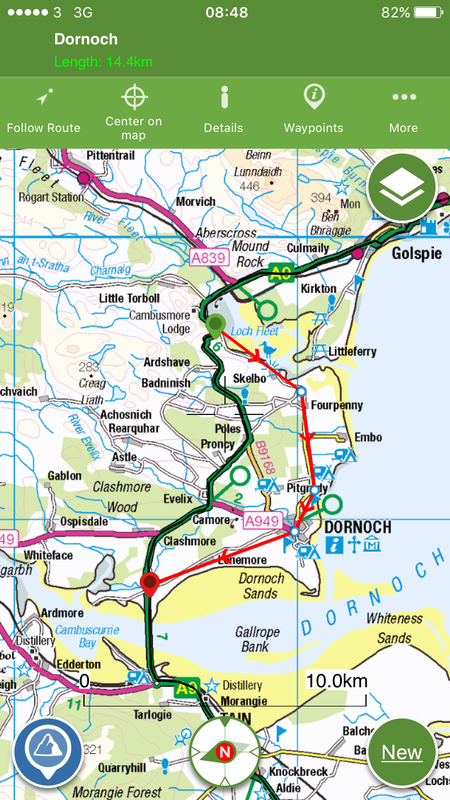 Watch out for the Berriedale Braes – a steep descent and brutal climb, especially with a headwind! I’d booked a B&B in Helmsdale and after doing all my back stretches fell into a deep coma. After coffee and cake (definitely back in civilisation now!) at Gordon House in Dornoch I headed back along the A9 to Tain. 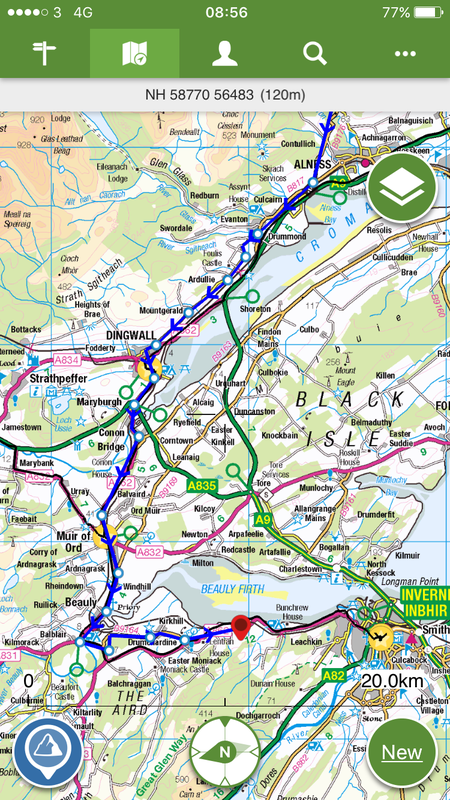 My back was holding out with some off the bike releases and I was then on the home straight retracing my route from Muir of Ord to Beauly and the final stretch along the Beauly Firth. For me this was an epic challenge. I set off knowing I’d have a tough 4 days with the weather and I sure did! People talk about the mental and physical side of things. I ended up talking to inanimate objects at the side of the road and the odd bit of road kill. There were times when I felt like curling up in my bivvy bag under a rock and giving up because of the relentless wind, but I didn’t. Mentally I (just) managed to hold it together. Physically my legs were fine and got me up the many many hills but it’s the things that come with conditioning (and possibly a professional bike fit) that would have made the biggest difference. A ride like this exposes the niggles that normally dont bother you. The 20-40mph headwind for the first few days took its toll on my knee. A chronic injury that has never bothered me on the bike, became a big problem. Sitting on a saddle for 7-7.5h on consecutive days, my bum and lower back were crying out. I ride my mountain bike about 3 times a week for maybe 3 hours at a time and a lot of that is standing up or off the saddle chatting. 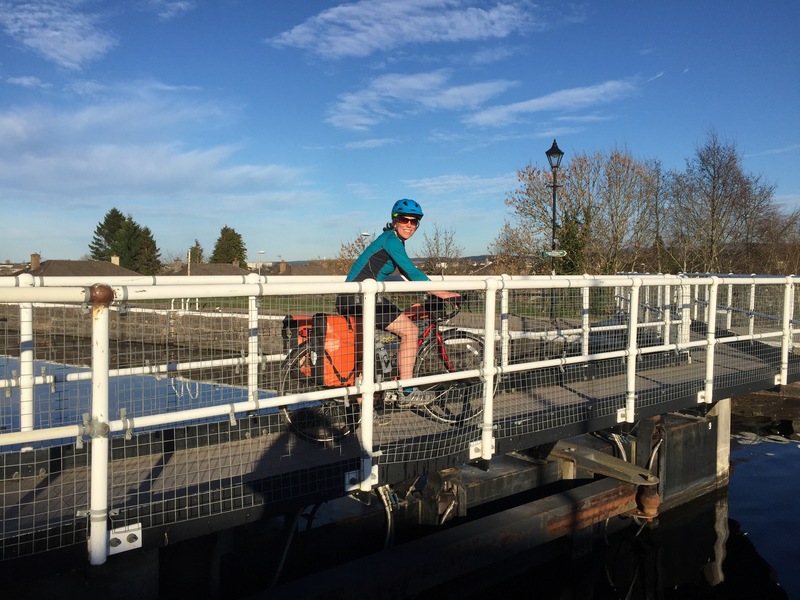 If I’d done some proper road training would it have helped? Who knows but I do know this is a serious undertaking and a completely different kettle of fish to being mountain bike fit. March threw up its own challenge……food. The fickle Scottish weather can catch you out anytime of year but until Easter pretty much everything is closed. This includes the hotels! Apart from Ullapool I had a dehydrated adventure meal every night for tea (can restock in the outdoor shop in Ullapool). March does have its benefits though. 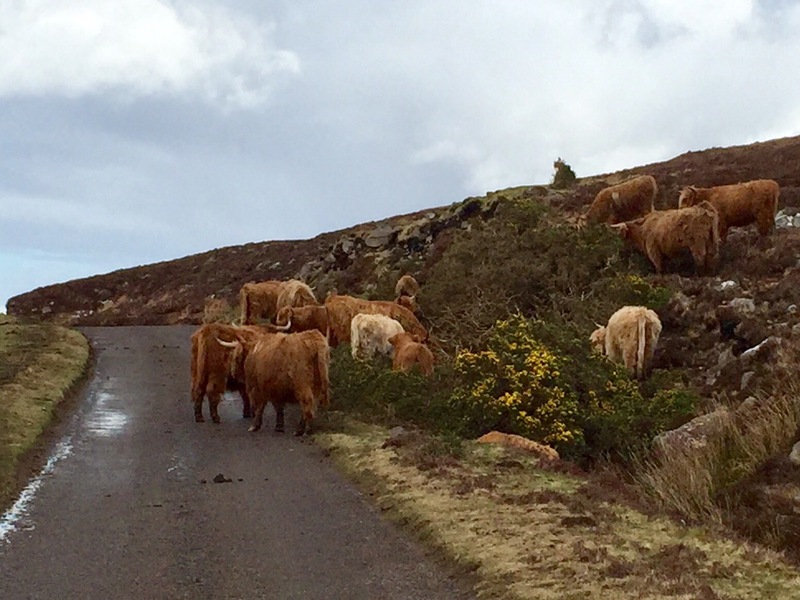 The only traffic you encounter is Highland cows, locals and Tesco delivery vans. You have the bunkhouses to yourself so it’s easy to dry off clothes and there are no midges! Good luck to anyone doing it and I hope the wind is your friend. 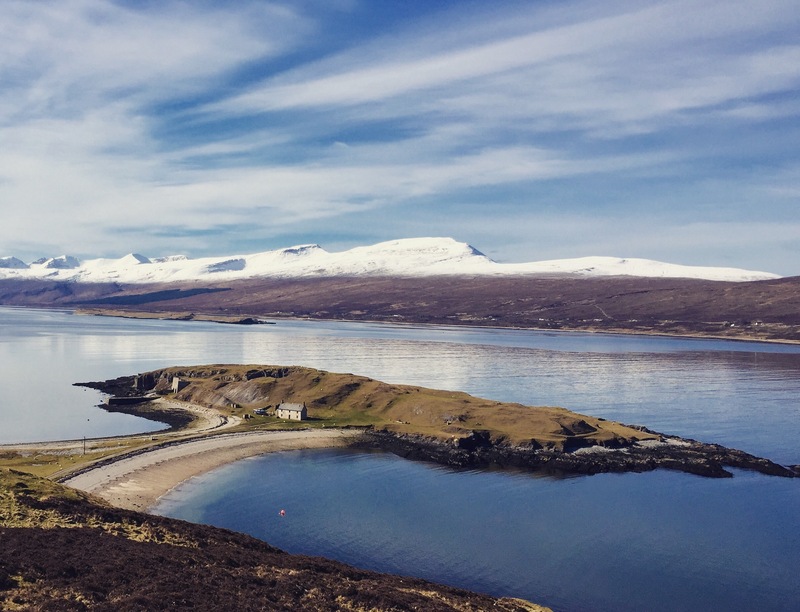 Scotland is a spectacular country and what better way to explore?! 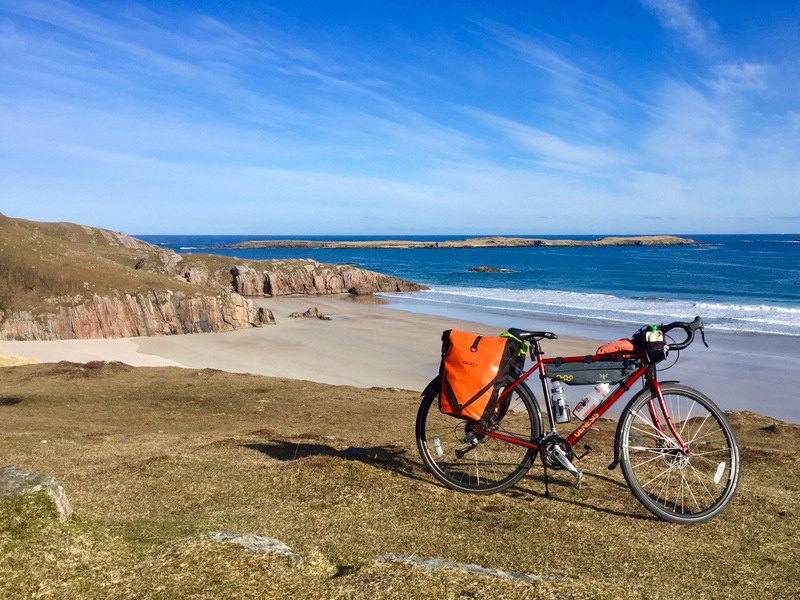 This entry was posted in Cycle touring, Outdoors and tagged blog, Cycle touring, Cycling, cycling nc500, nc500, north coast 500, northcoast 500, Outdoors, Scotland on 21/03/2017 by Mangoventures. Jamie McDonald: AdventureMan, Author, Speaker. Superhero Foundation. "Take nothing but pictures...leave nothing but footprints..kill nothing but time".